Novel injectable materials for non-invasive surgical procedures are becoming increasingly popular. An advantage of these materials include easy deliverability into the body, however the suitability of their mechanical properties must also be carefully considered. Injectable biomaterials covers the materials, properties and biomedical applications of injectable materials, as well as novel developments in the technology. Part one focuses on materials and properties, with chapters covering the design of injectable biomaterials as well as their rheological properties and the mechanical properties of injectable polymers and composites. 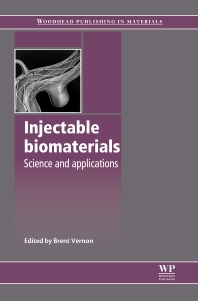 Part two covers the clinical applications of injectable biomaterials, including chapters on drug delivery, tissue engineering and orthopaedic applications as well as injectable materials for gene delivery systems. In part three, existing and developing technologies are discussed. Chapters in this part cover such topics as environmentally responsive biomaterials, injectable nanotechnology, injectable biodegradable materials and biocompatibility. There are also chapters focusing on troubleshooting and potential future applications of injectable biomaterials. With its distinguished editor and international team of contributors, Injectable biomaterials is a standard reference for materials scientists and researchers working in the biomaterials industry, as well as those with an academic interest in the subject. It will also be beneficial to clinicians. Brent Vernon is Associate Professor of Bioengineering at Arizona State University, USA.